This week marked the first week of the new Burmese Parliament. Democratic Voice Burma reported that Aung San Suu Kyi appears pleased with the first two days. 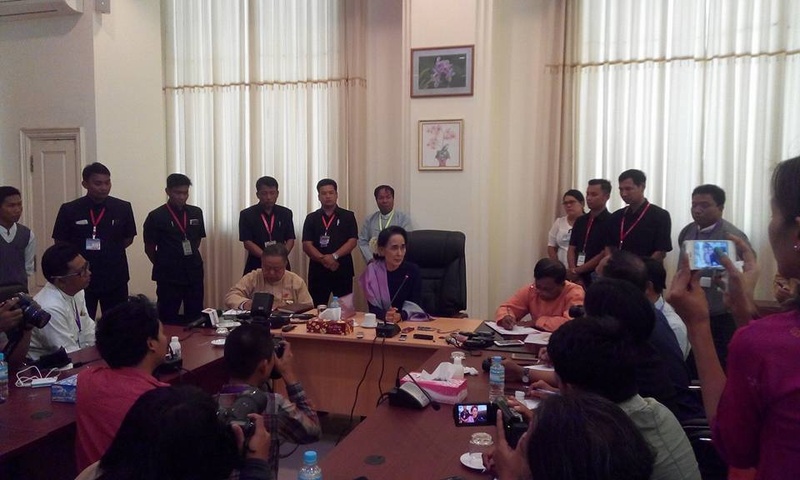 No decision as of yet has been made regarding Presidency nominations although there is speculation that NLD may be gearing up to challenge the constitutional constraint preventing Suu Ki from becoming President herself. Ethnic minority representatives make up a small minority of the new Parliament. Myanmar Times reported on some of the challenges and optimism that those, particularly from more remote areas, are facing during the opening. The Myanmar National Human Rights Commission (MNHRC) criticised authorities for their treatment of squatters during relocation from Rangoon’s Mingaladon Township and Mandalay Division’s Pyin Oo Lwin. About 500 households were demolished in Kon Ta La Paung village in Rangoon’s Pyinmabin Industrial Zone on 26th January. The Irrawaddy reports that civilians in Arakan State continue to be arbitrarily arrested on suspicion of links with the Arakan Army. Courts have been accused of adding charges onto those already faced by some of the students in prison follow the student demonstrations last year. More than 50 students are still on trial. The Sudan Democracy First Group has said that if the UNAMID leave conflict-torn Darfur, the severe protection and humanitarian crisis in the region will increase to a large extent. The UN Central Emergency Response Fund (CERF) has allocated $7 million to the office of the UN High Commissioner for Refugees (UNHCR) to help address some of the most pressing needs of the almost 200,000 South Sudanese refugees in Sudan. Eleven children reportedly died of malnutrition while taking shelter in one of the highest peaks in Jebel Marra at the end of January. Three women died of childbirth as well. The government of South Sudan has said it is to lobby leaders attending the African Union heads of states summit to include in the final communiqué a text rejecting the imposition of sanctions on officials seen as obstacles to the peace process. Similarly, Russia has said that it was opposed to placing a UN arms embargo on South Sudan or blacklisting President Salva Kiir and rebel leader Riek Machar as such moves were not helpful to the implementation of a peace deal agreed by the pair in August. On Monday the SPLM-IO accused forces loyal to the Juba government of allegedly using chemical weapons on their forces in Lanyi and Mundri. A new report written for the African Union and made public on Monday has presented an especially grim picture of South Sudan’s civil war, blaming the government forces and rebels for the declining humanitarian situation. South Sudanese civilians are dying of starvation as warring forces flout a peace deal, the chief ceasefire monitor has said on Tuesday, adding that he was “staggered” at conditions after two years of war. The government and the SPLM-IO have agreed on a phased, sequenced approach on the implementation of the transition security arrangements in Juba. However, the leadership of the SPLM-IO say that it is “unrealistic” to from the Transitional Government of National Unity this week. The Government of Japan has earmarked $1.65 million and delivered three ambulances to health facilities in three conflict-affected locations in South Sudan, where 250,000 women are reportedly in need of obstetric services. Aid workers are struggling to deliver food and medical aid to at least 44,000 civilians in Mundri, Western Equatoria state amid numerous reports of deaths of starvation in the area. The BBC published an article about a doctor who delivers baby girls for free in order to fight female foeticide. A new campaign aims to halt the illegal practice of identifying and aborting female foetuses. Hyderabad University reopens after the protests over the suicide of Dalit student, Rohith Vemula. 60 Dalit students from Bihar threaten to commit suicide after their funding for education and accommodation was cut. Indian women can now be the legal head of the family. Dalit family is stopped by upper-caste families from building a toilet for their home, leaving them to travel half a kilometre in order to defecate. More than 80 killed after fighters from the Islamist group razed the village of Dalori in northern Nigeria, shooting people and setting fire to homes. The Nigerian government has rejected claims of war crimes made by Amnesty International. A report by PwC reveals that corruption in Nigeria could cost up to 37% of GDP by 2030. According to an African Union official, funding falls short for a multinational force to tackle Boko Haram’s insurgency in West and Central Africa. The Parliamentary Assembly of the Council of Europe (PACE) discussed two Resolutions relating to the Nagorno Karabakh conflict. Indonesia and Timor Leste announce that they will conduct joint survey on the border dispute. Female activists from Timor Leste speak at a UN event on women’s access to justice held in Bangkok.